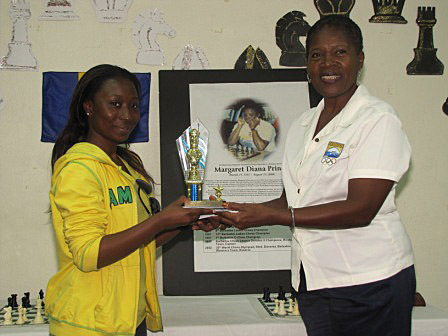 Jamaica Woman National Champion, Krishna Gray, won her final two matches to capture 1st place the as the curtain fell on the 2nd Margaret Prince Celebration Chess Tournament which was played over the weekend at The Chess Centre in Cavans Lane. Krishna Gray of Jamaica accepting her 1st place award. Photos by Barbados Chess Federation. For Gray, going into the penultimate round on a four way tie with Former Barbados Woman Champion, Corrine Howard, Martinique Woman Champion,Camille Sauveur and Maria Thomas, her win against Woman Candidate Master Sheena Ramsay, a former Barbados Woman Champion, was the last real hurdle standing between her and the tournament title.